It is possible to do this recipe with whole, unskinned mung beans, as we did initially, but the skins leave a gritty texture on the tongue, so I don’t recommend it. Look for “moong dal” at Indian specialty stores or split mung beans at Asian markets. They look like bright yellow split peas and should be fairly inexpensive. This recipe is a great way to get a ton of protein and fiber from a single part of your meal. All you need is a sauce and some veggies to make a full dinner… and these are filling, believe me. We had them with the Garlic Cheese Sauce I talked about last week, along with a simple cucumber-radish-tomato salad. 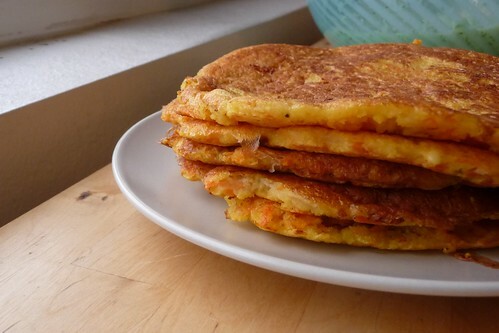 I love how full of flavor they are – they’re a lot like latkes or dosas. Puree the beans along with about 1/4 cup of water in a food processor until smooth and thick, adding water as necessary for a thick battery consistency. Stir in or pulse in remaining ingredients. The batter should now be like a very thick pancake batter. Heat a 10″ or larger skillet or griddle over medium heat and drizzle a bit of oil over. (Just like making pancakes. It doesn’t take much if you have a good pan.) Ladle out a portion, swirl to a nice round and cook until well-browned, about 5 minutes. Flip and cook for another 5 minutes. Repeat. This entry was posted in asian, dairy-free, gluten-free, recipes, untranslated, vegetarian. Bookmark the permalink. At times I also try raw food. Also very inspiring! I see you like quite some foodblogs.. y’might wanna add Golubka, a feast for your eyes.. let alone your mouth! !